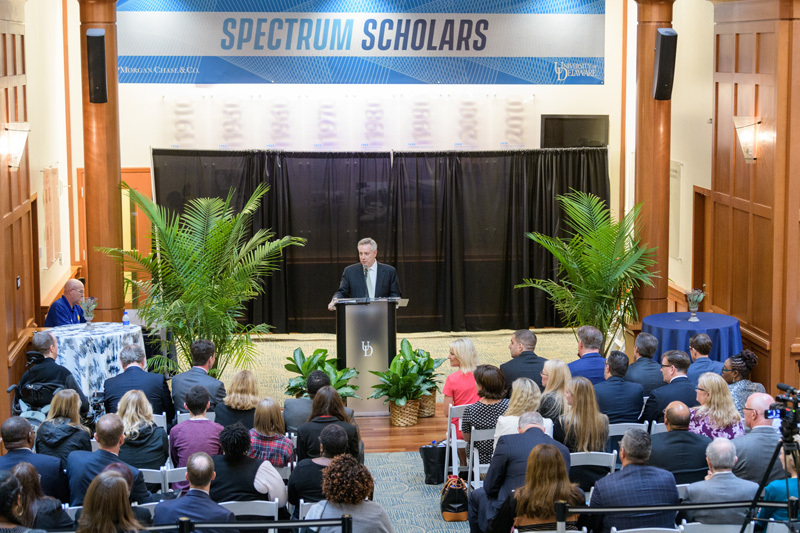 The University of Delaware and partner JPMorgan Chase launched Spectrum Scholars, a college-to-career program for students with autism, Monday, Sept. 24, in Alfred Lerner Hall on the Newark campus. Backed by a 10-year grant from JPMorgan Chase and administered by UD’s Center for Disabilities Studies, Spectrum Scholars will provide a comprehensive support system and career exploration opportunities to UD students with autism majoring in computer and information sciences and in electrical and computer engineering. Spectrum Scholars will also offer UD faculty and staff and community businesses training on working effectively with people with autism. JPMorgan Chase currently employs more than 100 people through Autism at Work, providing moderate accommodations where necessary and educating neurotypical managers and coworkers in effective communication strategies. Spectrum Scholars shares that focus on communication and relationship skills, areas that present challenges to many individuals with autism. Each student will meet weekly with a coach. The students’ sessions, shaped by their academic and career goals, may touch on topics as varied as recognizing the nuances of different relationships, refining executive functioning skills and growing as a self-advocate. Students will spend time with undergraduate peer mentors, too, while faculty and staff will receive training on the different needs that students with autism have. Spectrum Scholars will also have opportunities to prepare for life after college. These could be at UD, such as workshops on resume writing or job interview techniques, or in the community. Internships may be available with community businesses, including but not limited to JPMorgan Chase. “We want each student to be able to say to an employer, ‘Let’s talk about how to create an environment that’s going to allow me to be successful and meet your goals,’ ” said Brian Freedman, Spectrum Scholars director and associate director of the Center for Disabilities Studies. Debra Yarrington, a Spectrum Scholars faculty liaison and assistant professor of computer and information sciences, said she expects to see those effects firsthand. She said that, while many people with autism have strengths such as detail-orientation, logic-driven decision-making and concentration that make technology jobs a natural fit, collaboration is equally important. “With a little modification,” Yarrington said, “we can teach our students with and without autism better interaction skills.” She pointed to pair programming, a software development technique based on two-person teams, as a practice in which all students would benefit from communication training. Sam, an autistic UD student who contributed to the development of Spectrum Scholars and attended the launch, said the program will guide students with autism through challenges that she had to navigate on her own, sparing them a great deal of time and effort. She also emphasized the value of teaching job-search strategies and educating community businesses. It could lead to more comfortable and effective job interviews – events that, she said, often inspire dread in job-seekers with autism.